In this study, we propose a method of manufacturing spherical carriers with controllable and uniform particle size. Emulsification and a uniform design experiment were carried out to obtain the optimal fabrication process. The results show that a stable emulsification of oil in water (O/W) was achieved with an ~18.18 wt% polycaprolactone (PCL) oil solution and an ~13.02 wt% polyvinyl alcohol (PVA) aqueous solution. Finally, the uniformity of the PCL microcarriers was ~87.9% with a particle size range of 10−20 μm. In the future, medical carriers will be loaded with different officially approved medicines. The carriers could improve the bioavailability of pharmaceutical products, extend the duration of their effectivity due to drug and minimize their side effects. 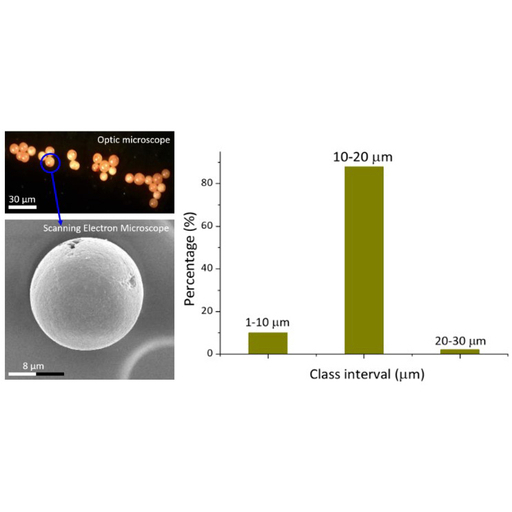 Cheng-Tang Pan, Yeong-Maw Hwang, Yu-Min Lin, Song-Wei Zeng, Shao-Yu Wang, Shiao-Wei Kuo, Shin-Pon Ju, Shih-Shin Liang, Zong-Hsin Liu, and Chung-Kun Yen, Development of Polycaprolactone Microspheres with Controllable and Uniform Particle Size by Uniform Design Experiment in Emulsion Progress, Sens. Mater., Vol. 31, No. 2, 2019, p. 311-318.